Preparing video for dissemination often requires that certain elements be hidden from the viewer. This is especially true with the increasing adoption of body-worn cameras. 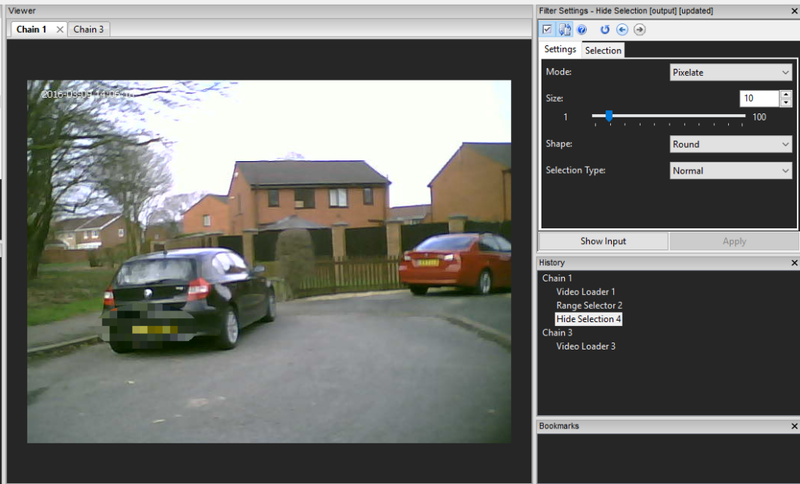 In this short post, I am going to highlight some of the filters that can be used, along with processing options, to make the job of video redaction much easier, quicker and most importantly, evidentially transparent. To ensure integrity, I always begin by applying a hash algorithm value to my loaded video. Quite often I will also insert the File Information using the Verify > File Info Filter, just so that information goes automatically into my report. From there I may have to trim my video to the part of interest. There are numerous methods to extract frames under the Select Frames category but the most commonly used is the Range Selector. An added extra within the filter’s settings, is the ability to quickly create a new file, just of the selected part, with no change in compression type or quality. 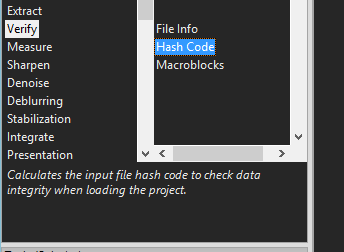 Not only do you very quickly get this as a new file, but it is loaded automatically back into the project as a new chain. This makes any subsequent analysis for another purpose much quicker. It must always be remembered that the lossless trim may be slightly different in frame count and start / end frame number. This will be due to the initial compression used and the requirement to start at an Intra-Frame. You could obtain a hash value and complete the File Info for this trim as well if required. 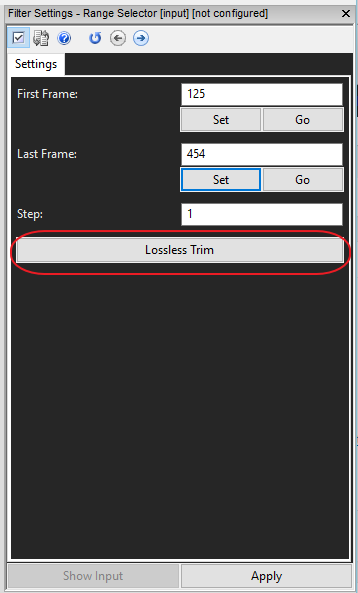 NOTE: It’s easier to simply work on the selected range without creating a new file, but in the circumstances when this is required, the Lossless Trim function makes the job easy. 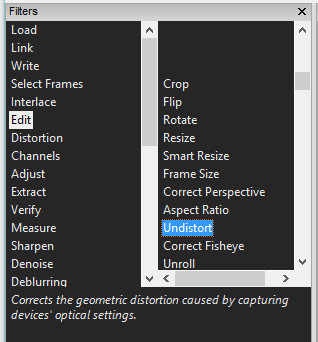 If the image had distortion caused by the lens type, which is quite common in Body Worn Video, then further corrections may need to be applied by using the Undistort or Fisheye filters. Another issue that may need to be fixed prior to redaction is any shakiness, again a common occurrence with body worn, helmet or handheld cameras. 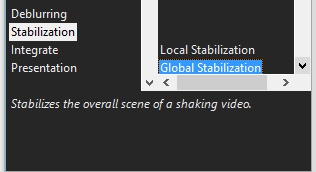 Global Stabilization works dynamically to reduce this visual effect and makes it much easier to watch. From that point, the usual redaction methods can be applied. Hiding a selection is easily completed by using, funnily enough, the Hide Selection filter within the Presentation category list. 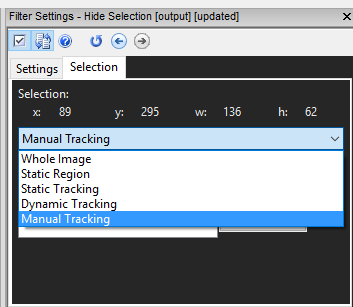 The area can be manually or dynamically tracked, depending on your requirements. 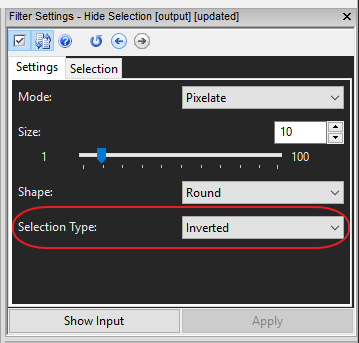 A recent update to these selection filters was to ‘invert’ the selection. 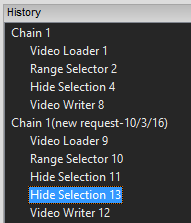 This makes hiding everything apart from a certain object a simple option change. You may not want to hide an area. 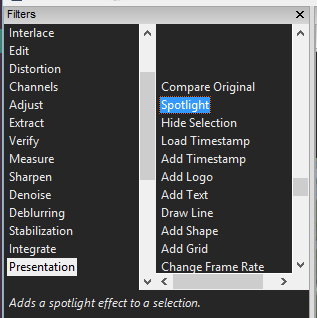 There may be a requirement to highlight a subject…again it’s a simple filter – Spotlight. It works in exactly the same way as the other selection filters. That is one of the great things in FIVE. If you know how one type of filter works, it’s easy to use the others as they have the same controls. Any number of filters can be applied. Hiding the faces of any number of people and then highlighting a specific person is easily achieved by simply adding individual filters for those people. The final stage would then be to output this new video. With the Video Writer filter, found within the Write category, it is a few simple clicks. The most difficult part being selecting your destination format. This will all come down to identifying beforehand, your target audience. There would be little point selecting a type that could not be played by whoever you sent it to. Also, you do not want it to be further transcoded by someone who perhaps didn’t understand what they were doing! This could result in a loss of quality that may reduce its evidential value and break any integrity in the creation of the evidence. 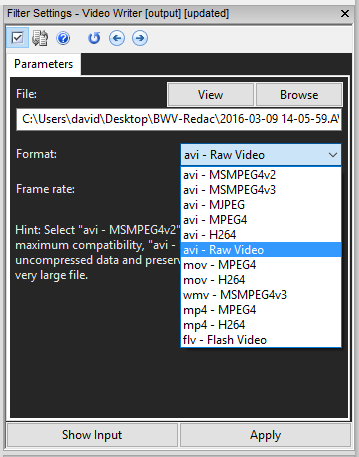 I hope that this has been of interest, and may have given you some ideas on how to conduct video redaction procedures in Amped FIVE. The most important part is that every single parameter is saved and recorded. Your processing report is completed automatically, using all the settings applied and, if you need to alter any settings or add in further points, it’s easy to do so. When further processing is required, I always use a copy of the chain and complete the new process within a new chain, rather than writing to the original one. This again gives complete transparency to your process. Right-click the chain needed > Copy… Paste! Or you could simply drag the chain down to the bottom of your chain list and release – a copy is then created automatically! That’s it for now. Remember to subscribe or follow the Amped Software social media channels found at the top of this page to ensure you do not miss out on future posts and updates….. and I know what some of the updates are – you don’t want to miss them!!!! This entry was posted in FIVE, How to on March 11, 2016 by David Spreadborough.